A recent Twitter exchange between Pret a Manger and an unhappy customer offers an important reminder that every customer interaction should be treated as an opportunity to deliver a positive, if not hilariously memorable, experience. The exchange started out innocently enough when a customer tweeted the brand about the taste of a crayfish and avocado flatbread sandwich. What did your chef put in the @Pret Chefs Special crayfish and avocado flatbread ? Tastes like my daughters sandpit. The company promptly responded to take the conversation into a DM. Upon resolving the issue and offering the customer a free lunch, the magic happened. Read on as Pret and the customer hilariously swap song lyrics riddled with fish puns—for a reported two hours via Twitter DM. So, what can you learn from this comical exchange? As Jay Baer wisely points out, he’ll take a hater any day over praise and positive reviews. Why? Those who complain and receive a response are almost twice as likely to recommend the company afterward. Regarding this customer complaint to Pret, not liking the taste of something is a tough one, as taste is subjective. Not everyone is going to like the taste of every menu item. However, let Pret’s response be a lesson to other restaurant and QSR brands: By showcasing that they were listening and offering the customer a free lunch, he will likely come back and try something else that he hopefully likes. Add in the subsequent comical banter, and the company has taken what could have easily been a simple customer service interaction to a place far beyond what the customer ever expected—all because of one tweet. Although it’s a common social media customer service practice to take the conversation to DM or phone, every word still reflects the brand—and can easily be shared online. As seen in this example, the customer tweeted an image of his DMs with Pret. Luckily, the messages were funny and a positive reflection of the brand, but there’s always the chance that they might not be. This is where training comes in. 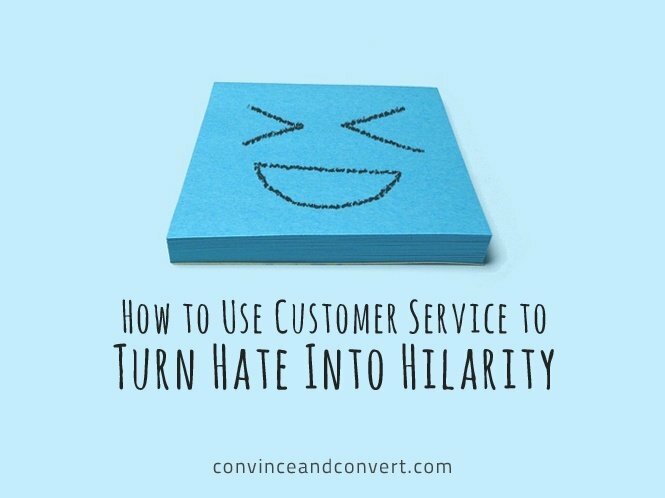 Too often, customer service teams are given a script and pre-approved messages to stick with—or else. While this is a good start from a training perspective, top companies empower their customer service teams to go beyond the script. One company that really rocks at this is JetBlue, which empowers its team of 20+ social media customer service reps to display a sense of humor with memes and GIFs, as appropriate. While this is clearly easier said than done in less regulated industries, training customer service teams on legal nuances, do’s and don’ts around product claims, or regulations helps the people on the front lines understand where they can have fun and where they need to stay on message. It would have been really easy for Pret to bow out once the customer service complaint was over. Instead, their social media customer service team seized a fun opportunity to display an impressive ability of merging popular song lyrics and fish puns. What’s even more impressive is that this was all done via DM for two hours. Had the customer not tweeted the DMs, we wouldn’t be writing about this. This is precisely why we need to shine a spotlight on these moments. Back when I was leading social media for a large company, I always looked at these moments as opportunities to educate the company about the power of social media to facilitate customer experiences and brand loyalty. Internal newsletters to placement on TV screens in high traffic areas of the office may seem like grassroots tactics, but my personal experiences show that success stories are highly memorable and validate your vision and mission as you lead a company on its path of digital transformation. The more employees, departments, and executives you educate and get excited about delivering remarkable customer experiences, the more opportunities you’ll uncover for collaboration and additional resources. Seize these opportunities to celebrate your hard-working team, while acting as the change agent to drive a movement within your company. Oh, and if you do have amazing customer experience case studies, I’m always only a tweet away.